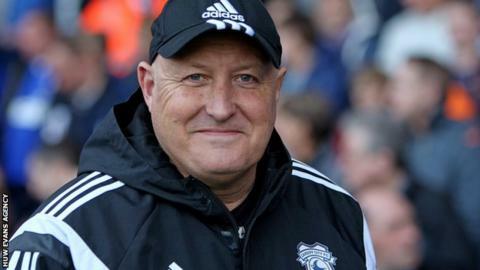 Cardiff City manager Russell Slade wants striker Kenwyne Jones to sign a new contract to stay at the club. Jones, 31, is out of contract at the end of the season and had opened talks over a new deal in September. But with no agreement reached, Slade is hopeful Cardiff can secure the long-term future of last season's top-scorer in January. "We would like to keep him. He is in my team currently and is a big part of that," said Slade. "We had initial talks at the start of the season and the chairman and chief executive then planned to hold further discussions in and around the January window. "The financial side of it and all those things will be considered, but, from the football side, when I pick a team, I am showing my hand as to what I think of players and when Kenwyne is fit he is starting for me." Jones' status as a first-choice striker alongside Joe Mason has meant Slade has allowed loan moves for forwards Eoin Doyle to Preston North End and Alex Revell to Wigan. That paved the way for the loan signing of striker Tony Watt from Charlton, and Slade says there is a "possibility" Cardiff could make that move permanent in January. A lack of goals has been a concern for the Bluebirds this season, mustering only 17 from their 17 Championship matches and just three from their last seven. Slade's side are still ninth in the table and three points away from the play-off places, though the manager admits he would like his team to play a more attractive brand of football. "You want to win, you want to win in good style and win with a swagger if you possibly can," Slade added. "But ultimately you need to win a game and fans will want to watch a winning side. I think the two go together hand in hand." Slade added: "Do we want to play with a little bit more flair? Yes, if we possibly can, we do." Cardiff host fifth-placed Burnley on Saturday, with Bluebirds midfielders Aron Gunnarsson and Anthony Pilkington potentially in line for a return after missing the preceding defeat by Derby because of injury.